Toys are the perfect way to keep kids engaged in the learning process. With these best-selling science and nature toys, kids can build their knowledge and STEM skills while having fun. My First Super Science Kit by BE AMAZING! The Big Bag of Science by BE AMAZING! Snap parts together to build different circuits, and watch the different pieces light up. Includes fiber optics over a light organ that can be connected to an iPod; the lights will flash to the beat of the music. Includes strobe lights with different plates so kids can experiment with strobe patterns, white LED lights, glow in the dark and lighted fan blades, a light up egg, and more. A great gift for the inquisitive kid who’s not squeamish. Kids grow their own friendly germs and fuzzy molds and can even mix up a batch of coagulating fake blood. If they really want to, they can make a stinky intestine. No matter what, they learn the science behind unmentionable bodily functions while doing some truly nasty experiments. This 42" bamboo butterfly and fish net has a 10" metal frame. Box price: $7.50; pieces per box: $10.00; price per piece: $0.75. — Michelle Deutschmann, owner of Kaleidoscope Toys in Falmouth, Mass., told TDmonthly in August 2008 that she had sold more than 200 butterfly nets since the beginning of summer. The Geek & Co. Science kits make science fun and affordable! With Crystal Nightlight, grow a big, beautiful crystal from alum powder, then wire up a color-changing LED circuit. Put them together to create your own nightlight that glows in a spectrum of colors! GeoSafari® Jr. My First Microscope by EDUCATIONAL INSIGHTS INC.
Get preschoolers excited about science and introduce them to the miracles of magnification with My First Microscope! 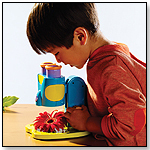 Magnify any small object – flat or dimensional – at 8x with this real, working microscope designed especially for little kids! Encourages scientific exploration; Rewards curiosity ; Introduces kids to a key scientific tool.